2011 Toyota Cape Dealer Rally in the Swartland. Poulter and Coetzee using all the road in Stage 8 on Saturday. Conrad Rautenbach and navigator Nicolas Klinger have won the 2011 Toyota Cape Dealer Rally in the Swartland in their Green Fuel S2000 Ford Fiesta, 23 seconds ahead of Enzo Kuun and Guy Hodgsong in their BP Volkswagen Racing S2000 VW Polo and Charl Wilken with navigator Greg Godrich in the Basil Read/Bizhub Ford Fiesta. John Peiser and Craig Grey were the top non S2000 runners in their S20 Subaru Impreza. In the good old days you could tow anything with anything. That has all changed. With successive legislation it has become more complicated and confusing, but safer. The biggest issue is the mass relationship between your towing vehicle and the trailer. 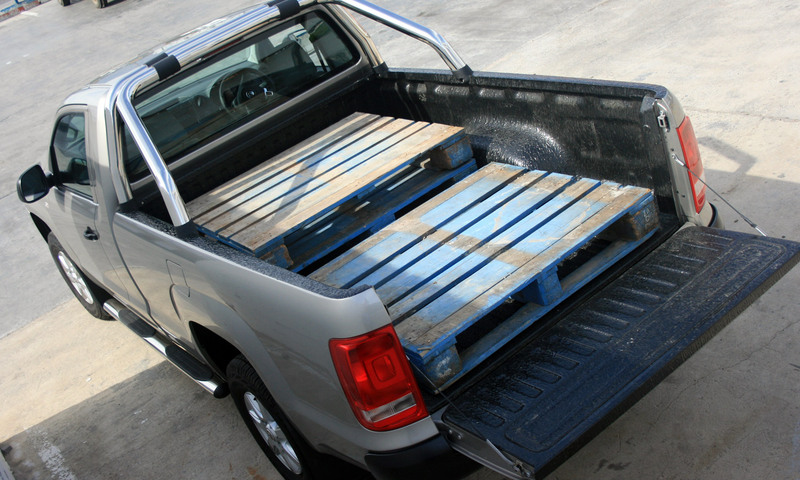 You will find the GVM (gross vehicle mass) of your trailer and your towing vehicle on a plate fixed to the vehicle, in the handbook or you can ask the dealer/ manufacturer. To tow any trailer with a GVM of up to 750 kg, the Tare (unladen mass) of the drawing vehicle must be double the GVM of the trailer. Should the trailer be equipped with its own braking system and fall into the category of 751 kg to 3 500 kg GVM, the Tare of the drawing vehicle must be more than or equal to the GVM of the trailer. If you have brakes fitted to the trailer you can tow up to your vehicle’s GVM providing that you do not exceed the 3500 kg trailer GVM. A trailer that exceeds 3500 kg GVM must have a service brake in addition to over-run brakes. The towing of trailers is governed by legislation and regulations, which are not 100% the same for passenger cars, bakkies and trucks but do follow the same basic rules. The minimum motor vehicle (car) licence allows the driver to tow up to 750 kg. To tow anything that has a GVM exceeding 750 kg you require a driver’s licence with an EB classification. You can apply for an exemption to an EB licence; you must have been in the possession of a valid driver’s licence prior to the new credit card licences being issued. • Any trailer up to 750 kg GVM requires a parking brake. • Trailers weighing between 751 kg and 3 500 kg require a parking brake and overrun brake/service brake. • Trailers weighing in excess of 3 500 g require a parking brake and service brake. The GCM or Gross Combined Mass has to be displayed on a vehicle’s identification plate. To determine what the vehicle may tow you have to subtract the GVM from the GCM, i.e. GCM less the GVM. A Chevron is a board with reflective yellow and red striping set at an angle that must be fixed across the rear of a trailer or caravan. All new trailers as well as any vehicle with a GVM exceeding 3 500 kg requires a Chevron board. In addition two red triangles are now required on trailers up to 3 500 kg. Contour markings refer to the yellow reflective tape, which must be applied to all trailers. Remember to add the weight of any equipment and fittings you install to the weight of the trailer to make your final calculations. 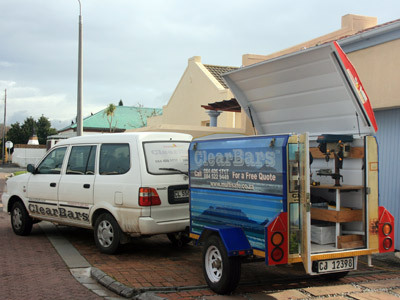 It is also important to get the balance between your bakkie and the trailer as well as the balance inside the trailer right. If in doubt get advice. Getting the balance right will make a big difference. The Americans believe nothing beats a big block; cc’s and many of them, preferably with a V8 configuration is king. They have a point. The new boosting technologies for both petrol and diesel engines have changed the picture a bit though. If you are planning to use a diesel towing vehicle an automatic gearbox will reduce strain on the engine. Petrol engines are less susceptible to stress damage. I firmly believe a slightly bigger engine is always better when towing. It gives you an edge when you need it. It may also reduce fuel consumption. If you are going to acquire a trailer and a vehicle, research the trailer first and determine which type of vehicle will be best for you. Make sure that you install either the towbar of your vehicle’s manufacturer or from a reputable aftermarket fitment centre. The correct anchor points and electrical connections are critical for safe towing. The upper medium class of sedan or saloon was the big segment in our market 20 years ago. Think of the 5 series BMW, the old E class Mercedes, the Valiant, Toyota Cressida, Ford Granada and Chev’s Constantia and later 4100 based on the Opel Record. In the intervening years people have bought down or smaller cars. Recently manufacturers have put a lot of effort into this sector. As a result the brilliant Sabaru Legacy, Mazda 5 and VW Passat have made their appearance in our market. These are brilliant cars, none better than the new Passat. The first impression is one of space, refinement and style. The boot is huge. The new Passat also has all the new technology. It is fitted with six airbags, ABS (anti-lock braking system), Electronic Stabilisation Programme, hill hold control and whiplash-optimised head restraints as standard. The options list is comprehensive, but beware it all adds up alarmingly quickly. The business class interior is built up of soft-to-the-touch plastics forming the dashboard, a simple analogue clock in the middle, with brushed metallic accents. It is VW interior design at its best. All the normal higher end cockpit tools are found in the new Passat. From multi function leather trimmed steering wheel to a very good sound system and optional satnav in the car we drove. The seats are very adjustable and comfortable, including warming and cooling. Very smart. The TopGear gang had this to say about it: “It’s quiet, comfy, econ omical, beautifully built and safe. And strangely enough that doesn’t actually make it boring to drive.” I really enjoyed driving it on the mountain passes in the Boland and even the slightly dodgy gravel roads of De Hoop. 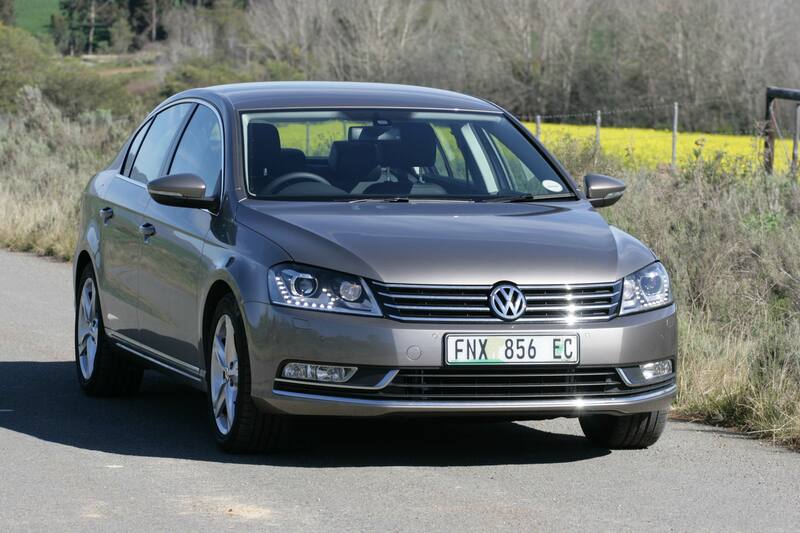 This Passat handles everything with unflappable aplomb. If you are looking for car with space, both for the passengers and in the boot, look no further. This car is much better than you expect. It really delivers more and it feels solid. The Passat costs about what the smaller Golf TDI highline, Honda Civic CTDi VXi, Audi A4 1.8 FSI, Volvo S40 D2 or BMW 120i costs. For the same money you get to drive a roomy, comfortable, well built, smart car that enjoys more than adequate power, good balance and very good handling. Also look at the Mazda5 and the Subaru Legacy. An average fuel consumption of around 7 litre/100km can be expected dropping to 5.3 on the open road for the petrol model. The diesel is even more frugal with an average of around 6 litres / 100km achievable. 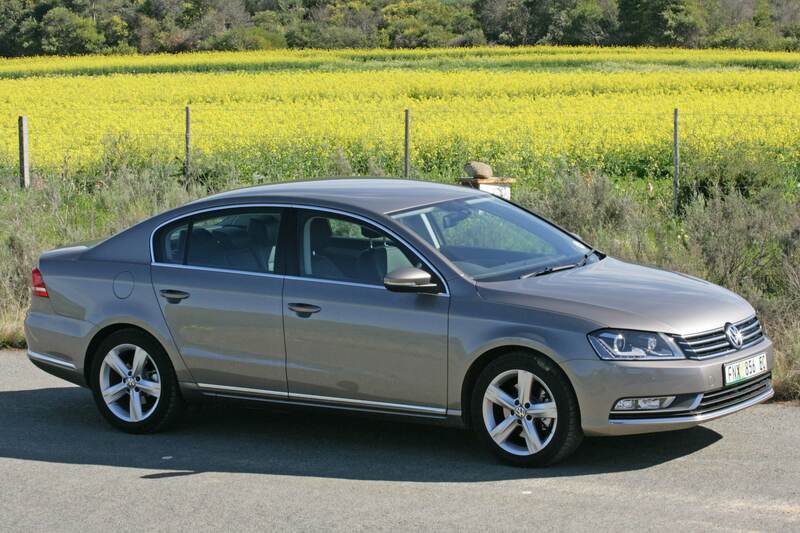 Prices start at R196 900 for the TSI manual to R327 600 for the TDI DSG, but watch the optional extras. Passat comes with 3 year/120 000km warranty, service plan of 100 000km/ 5 year and a 12 year anti-corrosion warranty. 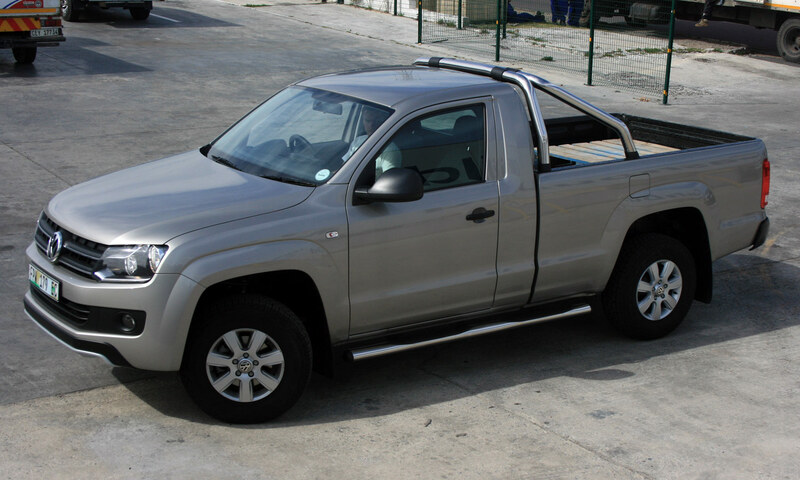 VW’s first foray into the one ton bakkie market is the Amarok. First up was the double cab followed now by the single cab and petrol engine. The bakkie is available with either a 90kW or a 120kw version of their 2 litre turbo diesel engine. It is a big vehicle, capable of carrying in single cab format 1.25 tons, two euro pallets (1 200 x 800mm) and rated to tow a 2.8 ton trailer, with the more powerful engine option. A 2.0 TSI petrol version is also available. There are two trim levels, basic and trendline. The Amarok is a pleasure to drive. The cabin is spacious, well laid out and everything works well, even the normally sticky VW 2nd gear is smooth. The steering wheel is height and reach adjustable. Flooring is rubber, but the noise levels are low. Unladen and with a light load the road manners and dynamics of the Amarok are car like and much better than the market leading Toyota Hilux. In spite of its size, its easy to drive with one proviso. The clutch takes immediately. This means that you will probably stall a few times before you get used to it, and tricky situations can become a bit more tricky. Passing takes a bit of planning and work with the gear lever. Fuel consumption, space in both the cabin and the loadbay, the extra carrying capacity and the class leading cabin are all strong points. The top models have traction control and a rear diff lock. There is a rear facing light for the loadbay, which we unfortunately could not get to work. Possible negatives include the actual size (she is wide and long), the narrow torque band and the uncertainty about the possible long term serviceability issues such a small block working very hard may cause. The Amarok will not fit into all garages and parking spaces. The only attachment points are on the floor and the loadbay does not come with a tough lining, it’s an optional extra, like the radio, ESP (stability programme) and electric interface. The clutch is a bit of an issue as it takes some getting used to. Two euro pallets in the loadbay. If you plan on towing anything but the smallest Venter trailer we recommend you get the 120kW version as the 90kW engine will struggle and your fuel consumption will be high. You can in any case expect higher fuel consumption with the smaller engine in real world conditions although VW claims otherwise. Amarok’s come with a 5 year/ 90 000km service plan and 3 year/100 000km warranty. Competitors are the Nissan NP300 R251 000 and Toyota Hilux R323 600. The Isuzu KB250 Fleetside 4×4 lwb is R217 000. Drivetrain: 1 968cc, 6 speed manual producing 120kW@4 000 rpm and 400Nm@1 500 – 2 000 rpm. Performance: 0 – 100km/h in 10.8sec, top speed 180km/h, combined fuel consumption 7.9litres/100km, fuel tank 80 litres. As Tested: Price R338 500, includes metallic paint, radio and running step.